You really did seem to enjoy sharing all your "Favourite Things" with us in June and there were so many contenders for the months 'In the Spotlight' feature, but as always we had to come down to just two from all the fabulous entries and I am very pleased to announce that these are Nanda and Lorraine with two stunning pieces of artwork. As an aside before I move on, when I read what Lorraine had written it raised quite a smile and brought back so many memories of days spent sticking loo roll tubes together, usually with glue made from flour and water, paint all over the place, then total frustration that it never quite looked like the one on the TV, or in my case, usually fell to pieces as soon as I moved it. I'm sure lots of you remember those days and like me, think how things have moved on with all the fabulous crafting products now available.............who knows what we might have created if we had had just a few of them back in those days ? We would love to hear your Blue Peter stories and it would be great if you left us a comment or mailed me brenda@ibas.co.uk with your memories. If anyone has a picture of what they made that would be even better. I Have a feeling that for many of us, our crafting journeys started back then without us even realising it and if I hear from enough of you, I thought it might be fun to share them and do a special post dedicated to Blue Peter memories. OK, now back to your winning entries, a few words from the DT about them and also something about both of our winners. "A well known children's programme (Blue Peter!) were making a 3D picture out of wrapping paper and a bathroom tile. I was about 8 years old and had to have a go! My crafting addiction had begun!! 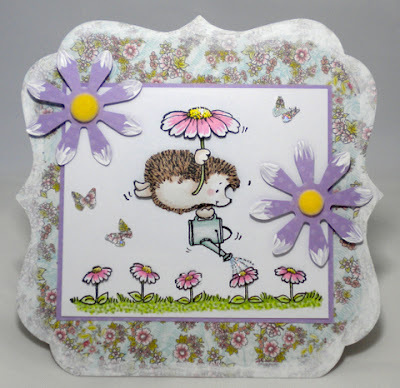 I spent many years making decoupage cards and just before Christmas my Husband bought me some promarkers so that I could try something new. Now all my spare pennies go on rubber stamps. I've only been colouring for about 7 month and I LOVE it!! 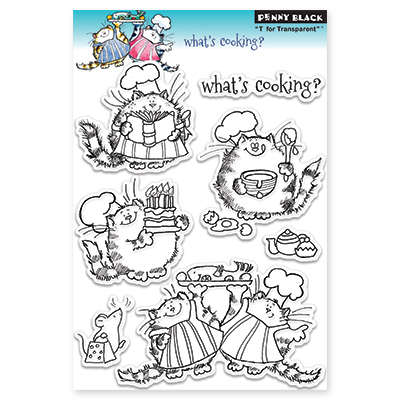 I'm also addicted to Penny Black stamps! During the last 6 months I've made lots of new blogging friends and hope to make lots more. 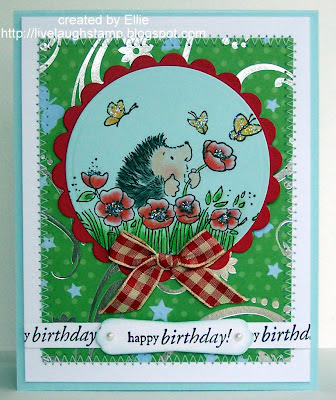 I'd like to say a BIG Thank You to Brenda and the DT for picking my card this month. I really appreciate it". 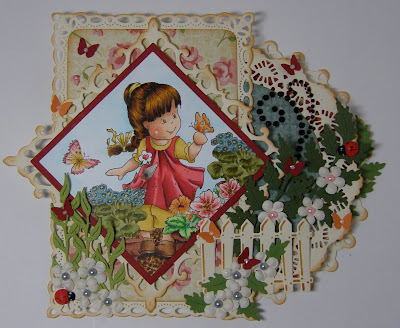 "I am Nanda and I started making cards when I was 18. I started with 3d cards. Every new technique on the market I tried. After many years I found the stamps. I Liked that alot and started with stamping. 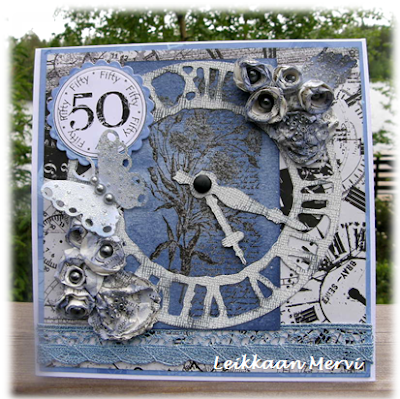 At the same time scrapbooking came into the Netherlands. So I gave that a try too. 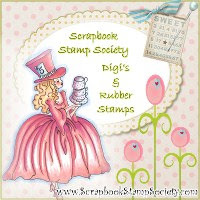 Now I make cards with stamps and I still scrapbook alot. I like making cards because of all the little details and the small work area. But I like scrapbooking too, because it is bigger, the work area is different". Congratulations to you both, very well deserved credit for your work. Please go grab our In the Spotlight logo and wear on your own blogs with pride. This months 'Summer Blooms' theme is also proving popular, but if you have not had chance to join in yet, or would like to enter again.....you can enter up to three time, there's still plenty of time and of course some great prizes to be won. As always you can create anything you like, be it a card, tag, gift box, l/o and so on, all we ask is that flowers are the predominant feature on your work and of course it's a stamped image. Remember, no digi images are allowed but you can use any make of stamp and if you use a Penny Black stamp you will be eligible for an extra prize draw. And all eligible entries will be considered for our In the Spotlight feature where we highlight two crafters and their blogs. Sir Stampalot are our regular sponsors of the winning entry using a Penny Black image. We are pleased to welcome back Letraset who are offering a set of Prom Marks to one lucky winner. 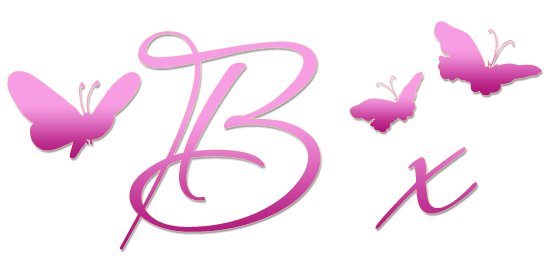 Their website here is a source of inspiration and carries information about their various colouring mediums along with tutorials by many well known faces of the crafting world. 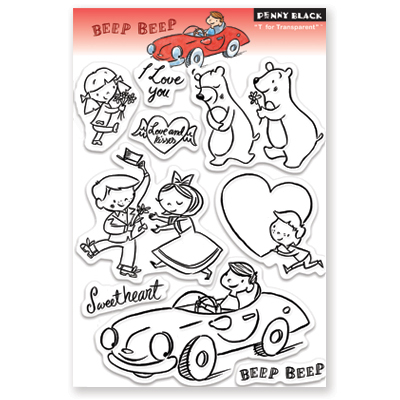 Addicted to Stamps are sponsoring us again this month and offering a $15 spend at the on line store to one winner. 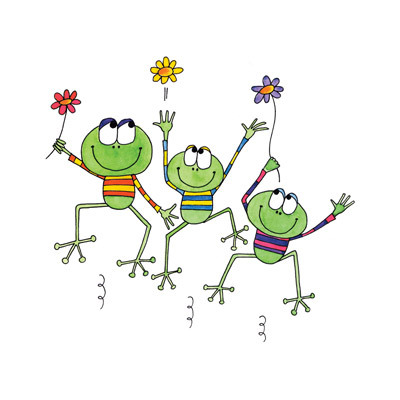 Do check our the store as they have some fabulous stamps and loads of other inspirational and unusual goodies. Now for some inspiration from the Design Team and our Guest Designer Helene, my team mate from Allsorts. Please do find time to pop along to their individual blogs and see more of their fabulous work. Have a lovely Sunday everyone, I hope the suns shines where you are and look forward to visiting your blogs to check out your lovely entries.